"Qué álbum más increíble!" Comunión es absolutamente impresionante por su belleza, honestidad y pasión. La mayoría de la música en el álbum es tranquila y discreta, pero cuando una pieza requiere rapidez, destreza, o poder, la virtuosidad sin esfuerzo de Zurmühle brilla en cada pieza. Esta música profundamente personal, viene directamente de su corazón. Doy al CD 'Comunión' mi más alta recomendación." 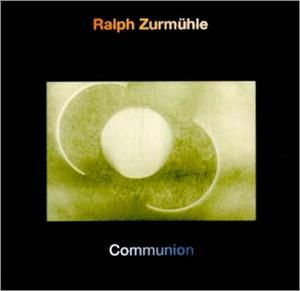 "Communion is the second of three mostly solo piano CDs by Swiss-born pianist/composer Ralph Zurmühle. Like his other two recordings, this one is absolutely stunning for its beauty, honesty, and passion. Much of the music is quiet and understated, but when a piece requires speed, dexterity, or power, Zurmühle's effortless virtuosity shines through every time. I listen to hundreds of piano CDs every year, and it's amazing how obvious it is when an artist really "has it." Ralph Zurmühle is one of those few who keep the barre raised for other pianists and who keep reviewers like me smiling. This is deeply personal music that comes straight from the heart. It works as relaxing background music, but is sublime to listen to with full attention. Communion begins with A Fairy Tale, a classically-styled piece that is gentle and bittersweet. Some of the melody is played in the treble registers of the piano, suggesting lightness and innocence; in other parts, the right hand crosses over to play the melody in the bass, giving the piece weight. A middle section is more improvised and free, then it returns to the original theme. What a beauty! Sublime Moments is serenity set to music and played with a velvet touch. The Train picks up the pace with energy and enthusiasm. Ralph obviously enjoys traveling by train! If I had the difficult task of picking a favorite piece on this CD, it would be The Ocean Beyond Time. A more soulful and passionate piece would be hard to find. Sometimes delicate and fragile and sometimes strong and powerful, this is a piece that makes my fingers itch to play it! At just under eight minutes, it evolves organically and without rushing - incredible! Alone is minimalism at its most beautiful. Dark and soul-searching, it captures the mood of feeling both physically and emotionally isolated. The last three tracks are a trilogy of pieces motivated by the Communion of Love, an ancient ritual celebrated by the earliest Christians, the Essenes. Ehyeh Asher Ehyeh is very spare but evocative - almost prayer-like. Quadosh, Quadosh, Quadosh is more orchestrated with ambient and atmospheric sounds behind leisurely strings, piano, and organ. At close to 14 minutes, it creates a quiet, peaceful mood and sustains it beautifully. Shalom is also orchestrated, with organ, ethereal voices, and strings combining into a wordless prayer for peace.This is another lengthy work (11 1/2 minutes) that evolves and builds as it goes, sometimes shimmering and sometimes almost cinematic. What an incredible album Communion is! I give it my highest recommendation. "I know I have said this before, but there are piano players and there are pianists. Ralph Zumuhle is the latter. I hear/listen to Ralph's music much like I do classical music. Mentally for structure and emotionally for reward. The structure is certainly fortified by classical undertakings, but the emotional reward is very contemporary. Frankly, there are very few artists like him (similar to Dulin, Lanz, Harry). Ralph is not prolific. He has realized only four albums, Communion, Our Mother, Between and eQuinox. I chose Communion, a mixture of solo piano and keyboards, for its quiet, passionate beauty, and reverence, but if you hear one album you will want them all. The theme of the album to me is one of connections with the world. The connection of everyday life; get up, go to work, come home to family and do it all over again. The connection with God. The belief in our God no matter what name you choose for Him/Her or just the belief in something greater than mortal man. And the connection with our fellow man. The unified search for peace in all its manifestations, whether it be peace of mind, or the peace from the burdens of hunger and unrest. The opening three cuts on the album, all solo piano, are daily experiences set to musical vignettes. The first, A Fairy Tale is sweetly childlike in arrangement, but the whimsical makes way for an examination into the beauty of innocence. Sublime Moments (In An Ordinary Day) is a retrospect to all the little miracles one witnesses throughout our day; the smile from a stranger, the unexpected helping hand, or the compliment from out of nowhere. All the things that give color to our personal canvas. And The Train, is a mesmerizing journey home. As quick as a blink the homes, the countryside, and perhaps the very lives of the people in our world flash by, but surprisingly, not in a blur. All is clear and vivid. The tune Alone briefly puts the overall theme on hold to contemplate another existence. I can identify with the song as I am in a unique position. The music I love so much and write about every day is a pariah in the region in which I live. Yet I persevere. Being alone is not always debilitating, but it is often melancholy just like this song. Known as the Sacred Salutation, Quadosh, Quadosh Adonai Tzeba'oth or Holy, Holy, is the Lord God of Hosts, is the greeting offered to the Lord when meeting Him on the throne. Ralph's quintessential entreaty is glorious and calm. The tune features a keyboard melody with a droning background that possesses a solemn quality. Under the right conditions it may produce a meditative state and that is as it should be. Ehyeh Asher Ehyeh or I Will Be What I Will Be is a doleful lament, but somehow remains reverent. It is serious and respectful, but the beauty of the tune stayed with me long after I listened to it. Finally, the last cut, Shalom, a well known greeting and word of parting meaning Peace. Like Aloha, and I am not trivializing it, it means not only hello and goodbye, but also prosperity or to makes amends. Surprisingly it is the equivalent of Salaam from the Arabic. This is one of the longest tunes on Communion coming in at 11:24. It is the second keyboard work and it is just dramatic in its composition and completely placid in its melody. Now that I am acquainted with Ralph Zumühle's wondrous work he is officially on my deserted island list of music. Listening to Ralph's music is like walking through an art gallery for the ears. I admit I see and hear the Impressionists more than anything else, but that is the sense I get when I hear the music and I love it. Rating: Excellent"